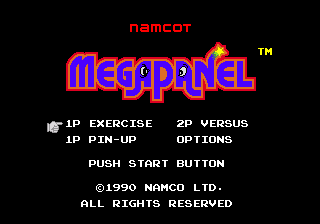 Megapanel (メガパネル) is a 1990 puzzle game developed and published by Namco (under their Namcot branding) for the Sega Mega Drive. Though initially released only in Japan, the game has made its way to the west through various compilations and consoles with built-in games. Megapanel is a sliding puzzle game similar to fifteen-tile puzzle games. The aim is to clear as many panels as possible before the pile reaches the top of the screen. In order to clear panels, three or more panels of the same color must be lined up together either vertically or horizontally. Use the D-pad to slide panels (each button indicates what direction to slide to, so the appropriate panel is automatically chosen) and to bring the next row up immediately. A new life is awarded every 10000 points.